This Corrugated Cooler Door Display is a very tricky temporary point-of-purchase display for refrigerated retail, constructed almost entirely of cardboard. Though cooler door displays can have impact, as retailer I’m not sure I’d want to clutter the glass and obscure visibility with permanent ongoing display. But putting temporarily POP display front and center, I’d be all for it. 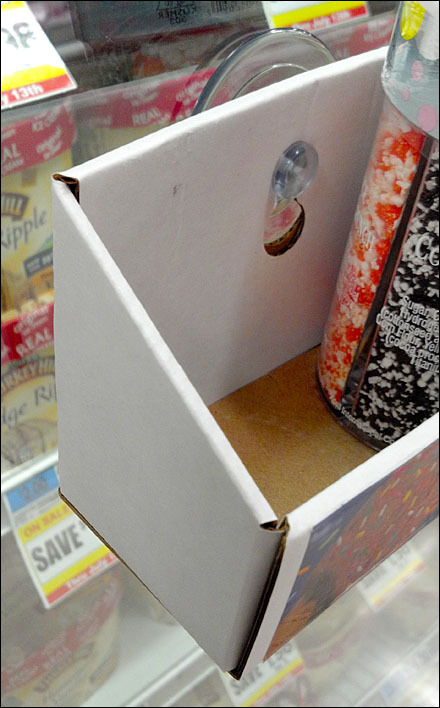 This throw-away corrugated concept motivates the on-door display, which then can be disgarded after. 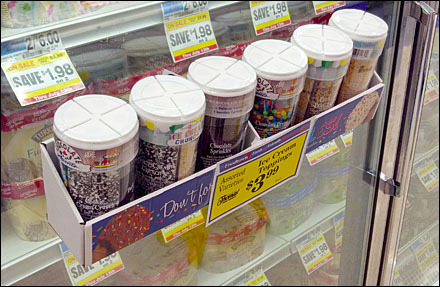 It fits the product so well, the display stays neat and orderly … even if down to the last package. See the Corrugated Cooler Door Display thumbnail for a closeup of construction. “Cooler Door Merchandising Pinterest Board“ for a visual summary. “Cooler Door Index Page” for all resources and links.